It was late afternoon. We’d gone to Charlie Elliott Wildlife Center in Jasper County to look for wildflowers and dragonflies. Our last stop was at Whitetail Lake. We walked along the dam where we found clusters of Sleepy Orange butterflies (Abaeis nicippe) sipping moisture to get salts from the mud. We headed back to the car after the sun had dropped behind the trees. The light was quite poor. 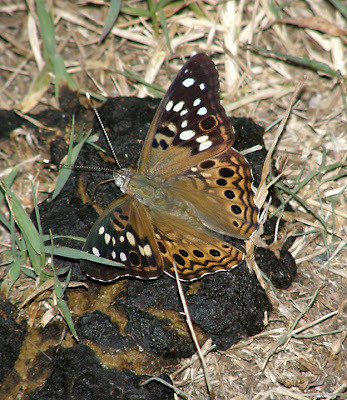 But there on some dung was a Hackberry Emperor (Asterocampa celtis) also sipping salts in the moisture. I used flash to take these photos. 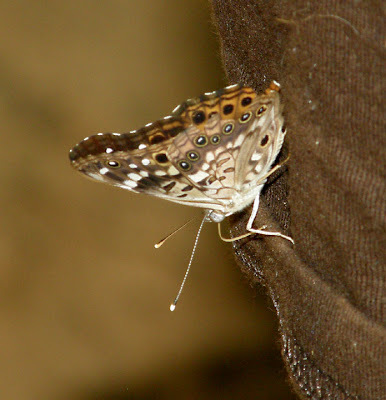 This is the first Hackberry Emperor I’d seen; he's a male. The Hackberry Emperor is not common in Georgia compared with other areas in the United States. He spent most of the time with folded wings. Occasionally he would open its wings. We went back to ‘Charlie Elliott’ a couple of days later to photograph wildflowers. We stopped along the road not too far from Whitetail Lake to photograph some thistles. This butterfly, also male, decided that Ws t-shirt was ‘taste of the day’ and proceeded to ‘collect’ salts. He was persistent and, If spooked, he would fly around for a few seconds and return again. He did this for 10 to 15 minutes. The reference to the Butterflies and Moths of North America gives the distribution map for it. 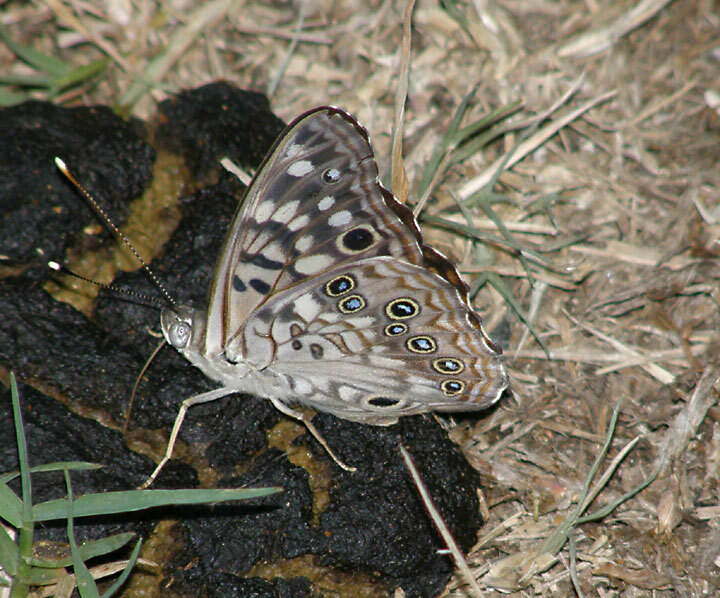 I hope you do have it; it's a nice butterfly and I was a little surprised by how calm it appeared to be. It's interesting, though, that I read it had been reported from Fort Yargo State Park which I visit quite frequently but I have never seen it there.